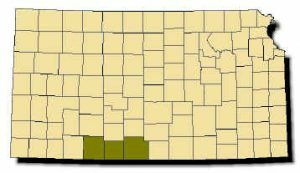 Range: Found in southwest-central Kansas in the Red Hills along the Oklahoma border in Barber, Comanche and Clark counties. Description: Harmless. 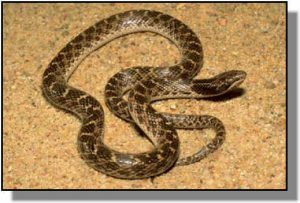 Smooth scales; body and tail are gray or grayish-yellow with 50–70 dark brown blotches on back; head is gray or brown with three large elongate dark brown blotches on neck. Only harmless serpent in Kansas with pupils that are vertically slit when exposed to light. Young are like adults. Habits: A small, secretive snake most often found beneath rocks on rugged hillsides between May and September. Breeding occurs in May and may continue during warm weather until fall; up to 5-6 eggs are laid which hatch in a month or so. Feeds primarily on small lizards and snakes. Never bites. When touched, may curl into a tight cone with its head tucked in the middle for protection.